Print with the pink hippopotamus! Building a memorable brand is a challenge, but with its signature pink hippopotamus, Wakefield-based Hippoprint has a head-turning corporate identity that’s as strong as its product. 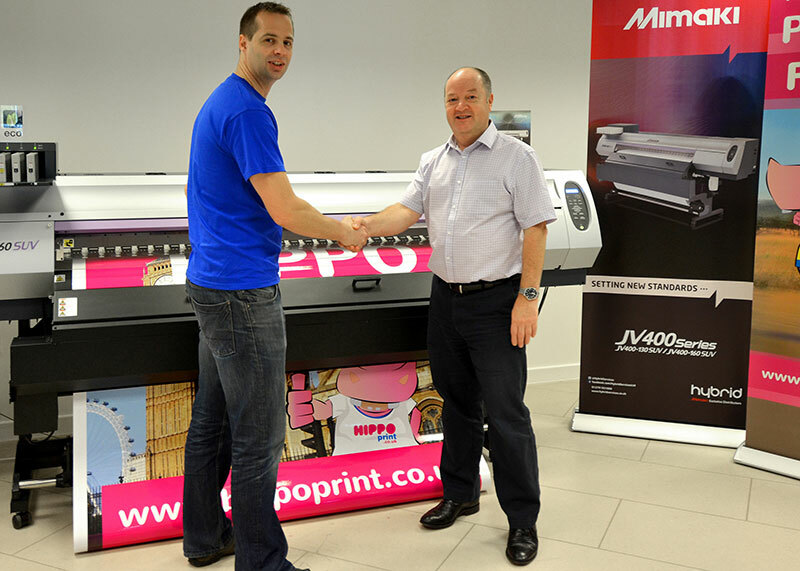 With a portfolio that encompass everything from traditional business stationery and leaflets, through to stickers, pull up banners and T-shirts, Hippoprint’s wide format capabilities are matched with an absolute guarantee of next day delivery, which is why the company’s owner, Anthony Wood, is to committed to investing in the right equipment. Currently in the midst of a program of replacing Hippoprint’s printer line-up with Mimaki solutions, Anthony was particularly interested in gaining a sneak preview of the new JV400-160SUV when he recently visited Mimaki’s UK and Irish distributor, Hybrid Services with reseller Granthams. The machine had only just arrived in Hybrid’s showroom, but so impressed was Anthony that he ordered one on the spot! Retaining customers can be a test for any online business, but Anthony has loyal customers who have bought into his ethos. He said: “We’re here to provide the absolute best service for our customers, so we’ll do crazy things to ensure it happens, whether that means meeting customers’ trains with boxes of business cards as they travel through railway stations, or swapping unused stocks of obsolete paper for homemade cake with local artists and schools!” And it certainly seems to be a commitment that’s paying off. An order from Kensington Palace appeared in his Anthony’s inbox recently, thus proving that a combination of great customer reviews and a significant investment in marketing goes a long way towards gaining the royal seal of approval! For further information on Granthams visit: www.granthams.co.uk. NextSwap the oldest for the newest! Once, twice, three times a VUTEk!